In our work on orphan enzymes, we’ve consistently seen a “rich get richer” effect. Research tends to accumulate on those proteins that already have assigned sequences. This is a systematic issue, since annotation based on sequence similarity probably means that we’re often assuming that a newly identified gene does the same function as a known protein…when in reality, it is more like a highly similar orphan enzyme for which we lack sequence data. We saw this occasionally in the generally awesome BRENDA enzyme database. A curator had assigned a sequence to an orphan enzyme when that sequence was actually for a highly similar enzyme that did not catalyze the orphan enzyme activity. This kind of over-assignment likely prevents further research on the orphan enzyme and tends to focus more research on the enzyme for which we had sequence data in the first place. In their recent paper Functionally Enigmatic Genes: A Case Study of the Brain Ignorome, Pandey and colleagues tackle this problem from the other side of the mirror – uncharacterized genes. They surveyed those genes that show “intense and highly selective” expression in the brain (ISE genes, for short) and asked “How well-characterized are they?” After all, one of the promises of modern high-throughput methods is that we can look at features such as tissue-specific expression and use that as a guide for which genes to devote our research attention to. What they found is that despite our knowing that these genes are all intensely and selectively expressed in the brain, research about them has been tremendously lopsided. 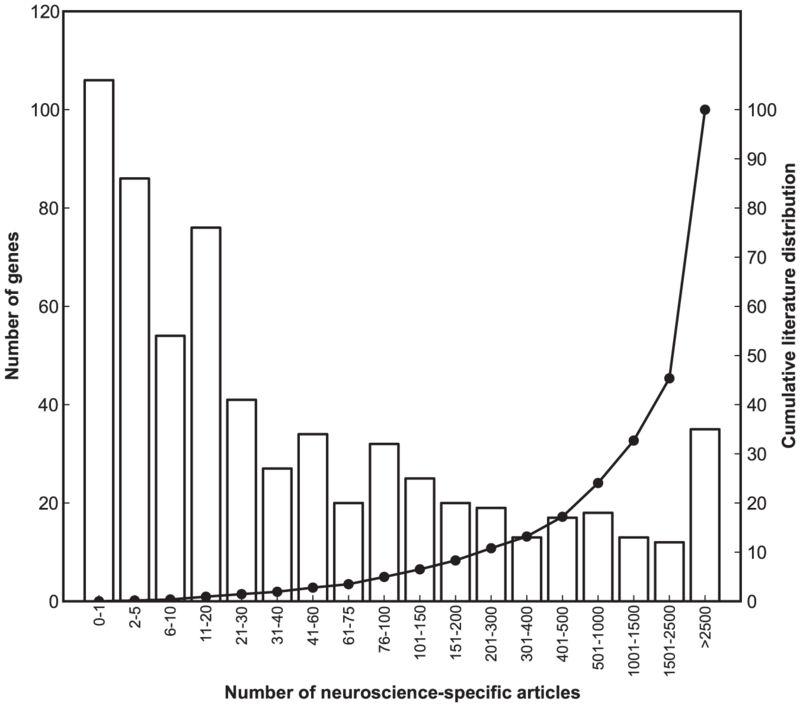 The number of publications for these 650 ISE genes is highly skewed (Figure 1). The top 5% account for ~68% of the relevant literature whereas the bottom 50% of genes account for only 1% of the literature. So that shows us that despite somehow being specific and important to the brain, many of these genes remain understudied. What makes the ignorome different? Much like the “rich get richer” phenomenon I talked about for orphan enzymes, there is (unsurprisingly) a correlation between when a gene was first characterized and how much research there has been on it. Nothing else really differs between the genes that are understudied and those that have been the focus of significant study. While the average rate of decrease was rapid between 1991 and 2000 (−25 genes/year), the rate has been lethargic over the past five years (−6.4 genes/yr, Figure 5). This trend is surprising given the sharp increase in the rate of addition to the neuroscience literature. As a result, the number of neuroscience articles associated with the elimination of a single ignorome gene has gone up by a factor of three between 1991 and 2012 (Figure 5). The rate at which the ignorome is shrinking is approaching an asymptote, and without focused effort to functionally annotate the ignorome, it will likely make up 40–50 functionally important genes for more than a decade. One of the core reasons for “rich get richer” effects is that known genes (or proteins) simply have more “handles” you can work with. If your expression analysis tells you that 20 genes are significantly enriched in your test condition and you can find some functional characterization for 10 of them, it’s only natural to focus on those 10 first. …and given how time and work tend to play out, “first” can quickly become “only.” Given how daunting a completely uncharacterized gene can be, who would fault researchers for spending the majority of their effort on those genes that have some functional characterizations (or predictions) available for them? That certainly fits the whole 80/20 rule idea of focusing most of your effort where you’ll have the most gain. Pandey and colleagues attempt to address this by making more handles. They show how we can leverage high-throughput and large-scale phenotype databases to generate additional functional characterization for at least some of the ignorome genes without significant additional effort. Now, instead of flying relatively blind, a researcher can have both sequence-similarity-based predictions of function and some best guesses at phenotype associations for these genes. I really like this kind of leveraging of existing data to make avenues of research more accessible and thus more likely. This kind of thing is going to be very important in tackling those dark areas of unknown function that exist all over biology. Ashutosh K. Pandey, Lu Lu, Xusheng Wang, Ramin Homayouni, and Robert W. Williams. Figure and quotes were used under the Creative Commons Attribution License. Alexander Shearer is a biologist working in quantitative biology and protein design at Serotiny. Before that, he worked at Zymergen, Clover Collective, and SRI International. He's also done some non-science writing, which you can read about here as well. You can email him at alexander (at) alexandershearer.com.